Rakeback is exactly what it sounds like. The player is getting a percentage of the rake they paid to the poker room back at the end of the month. This basically means that if you pay $100 in rake to Party Poker for the month and you are earning 50% rakeback then you will get $50 back at the end of the month. Be aware though that the maximum rakeback available at Party Poker is 50% and when you are starting out you will start out at a lower percentage. Signing up for an account at Party Poker takes 1 to 2 minutes – get one today and start enjoying the benefits that THOUSANDS of players all over the world are already experiencing. We have put together a list of questions that are common for players that are new to rakeback. 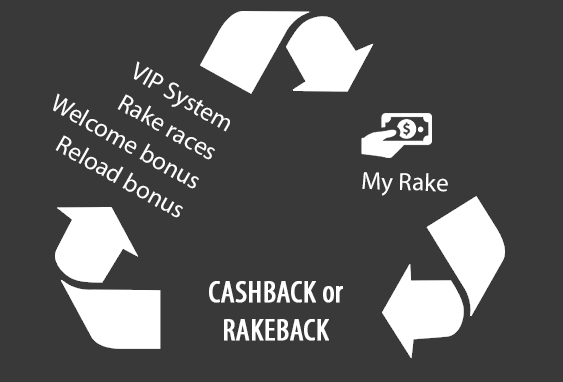 Once you are familiar with rakeback make sure to check out the directions above so you can sign up for rakeback at Party Poker and take full advantage of the Rewards system they’ve recently rolled out and revamped! Rake is basically the fee that you pay to the poker room. This fee basically covers the use of the poker room and is how the poker room makes money. Unlike traditional casino table games where you are playing against the house, poker is a game where players play against each other. At Party Poker, the rake is usually around 5% of the total pot and is capped at $3 per pot at most ring games. How Does Rakeback Help Me? If you are serious about online poker or just want to make money, then receiving rakeback is a must. Basically, if you are receiving 50% rakeback then this is money you are getting back at the end of the month — whether you win or lose at the poker table. This is a huge advantage since this money will help players hedge any of their losses for the month. Because of the huge benefits of rewards programs and rakeback, always make sure that the poker room offers rakeback or a VIP program. Also, don’t forget the benefits of rake races and chases, as they provide additional rewards once players rake a certain amount. This site currently offers $22,000 in exclusive monthly promotions at Party Poker: $12,000 in freerolls for new players and $10,000 in freerolls for non-new players each month. Qualifying for the weekly $3,000 New player freerolls will only require players to earn 1 Party Poker. The bi-monthly $5,000 freerolls will require players earn 200 Party Points during one of the qualifying periods which is during the first or second half of the month. How Do I Receive my Rakeback at Party Poker? You are 100% charge of your cash rewards via the VIP program on Party Poker. Once you have qualified for a VIP status level and wish to exchange your Party Points for rewards, you can simply purchase the cash or bonus and then the funds will be available to you. Purchasing a bonus will require an small additional playthrough requirement. What’s Better – Using Party Points for Cash or Bonuses? The instant gratification of the cash is certainly tempting, but Party Poker players are much better off choosing bonuses — which requires additional play — versus the instant cash. This is especially true for players that continually play on Party Poker. That’s because the points you earn when clearing the bonus also accumulate towards your next purchase. Can I Earn Bonuses and other Party Promotions In Addition to the VIP Program? Absolutely! The same Party Points that you earn towards the VIP program can also be used to clear the sign-up/ reload bonuses or for use in the popular cash-based monthly promotions that Party Poker is known to offer. So even though rakeback at Party Poker is “up to 50% VIP” players can conceivable earn even more.